Posted by grhomeboy in Sports & Games. The Greek city of Volos seeking to host the 2013 Mediterranean Games has made its presentation to the International Mediterranean Games executive board that met earlier this week in Cairo. The winner will be announced in October. The presentation took place at the Egyptian Olympic Committee headquarters which hosted the executive meetings of the International Mediterranean Games Committee. The presentation, held to culminate the two-day meetings, took place in alphabetic order. Each candidate city was given half an hour. Volos, the third largest port of Greece, and Larisa, two historical cities located in the region of Thessaly, in Central Greece, are known for their sports activities down the years. The objective of the candidacy, apart from the development and the international promotion of the cities of Volos and Larisa and the wider region, is to upgrade the Mediterranean Games and make them the most important sport event in the Mediterranean region, to attract the best athletes of the participating countries, to offer hospitality to the largest number of visitors and to provide the best preparation, accommodation and competition conditions to the athletes. Deputy Minister of Sports George Orfanos said the hospitality of major international events in Greece “are part of our policy’s priorities. Greece is able and willing to organise the Mediterranean Games, as it has a unique experience in international events. We will be ready to host a unique Mediterranean Games in 2013 if you give us the honor of selecting us,” Orfanos said. 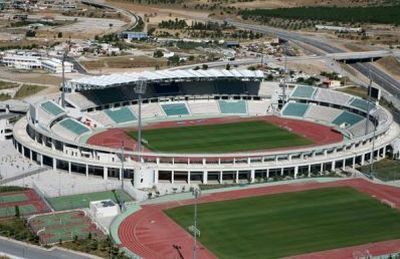 The last Games were held in Almeria, Spain in 2005 and the next Games are in the Italian coastal city of Pescara in 2009. The Mediterranean Games are a multi-sport games held every four years for the nations bordering the Mediterranean Sea. The idea of holding the Games was proposed at the 1948 Summer Games by Mohamed Taher Pasha, President of the Egyptian Olympic Committee. They were inaugurated on October 1951 in Alexandria, Egypt, in honour of Mohamed Taher Pasha, the man to whom their inspiration is owed, with contests being held in 13 sports along with the participation of 734 athletes from 10 countries. Ever since, they have taken place without interruption. In 1993, it was decided it should be held every four years. The Mediterranean Games stand as the greatest sport event of the Mediterranean region, attracting the interest of the maritime countries, where Europe, Africa and Asia meet. The Games are an opportunity for a peaceful confrontation between youth from three continents, different cultures and religions, yet bound together by a common ideal, the Olympic Ideal, which sprung from an ancient Mediterranean country, Greece, the cradle of the western civilisation. A chance is thus given, through the Games, for young people to get to know each other, appreciate each other, reaffirm or strengthen their ties in a climate of peaceful rivalry. The vision of the bid committee is to bring together high level athletes from all the Mediterranean countries who will compete in line with the Mediterranean ideals, fair play and the regulations of the international sports federations. The Games, held under the auspices of the International Olympic Committee, fall within the competence of the Hellenic Olympic Committee in terms of the preparation and composition, precisely as for the Olympic Games. Their establishment must be credited to the HOC for it played a leading role in their being founded. Athens is the permanent seat of the International Committee of the Mediterranean Games, irrespective of who the president might be, and the committee’s general secretary is Greek. This is a further tribute to Greece, highlighting its leading role as regards the function and strengthening of the institution. The logo of the Games, called the ‘Mediterranean Olympics’, is composed of three white rings symbolically representing the three continents Africa, Asia and Europe that have coasts on the Mediterranean, reflecting themselves in the blue colour of the sea. The logo has been used since the Split Games of Yugoslavia in 1979, for which it was devised and afterwards accepted for the whole Games. During the closing ceremony, the flag of the Games is transferred to the country of the city chosen for the organisation of the next Mediterranean Games. International Olympic Committee President Jacques Rogge announced the patronage of the IOC to the Mediterranean Games and that he will attend the opening ceremony of the 16th Games in Pescara on 26 June 2009. Posted by grhomeboy in Hotels Cyprus. In the second year of operation for Thomas Cook to Larnaca, the Palm Beach Hotel & Bungalows has won the U.K. operator’s “excellence award” for 2006 voted by holidaymakers who stayed at the hotel last year. The hotel underwent a refurbishment programme of a number of the bungalows as well as the suites in May at a cost of GBP 200,000 (CYP 150,000), giving these rooms a new look and upgraded facilities. Savour some souvlaki at this weekend’s Greek Day street party, which is a great chance to try such Hellenic treats as mastic, spanakopita, and honey-drenched loukoumades. Greek Day > A month of Hellenic celebrations culminates in a street party this Sunday from noon to 9 p.m. Greek associations hawk gyros, spanakopita, Greek salad, chicken and pork souvlaki, and more. Restaurateurs and grandmothers share recipes from the cooking stage, which this year offers tented, shaded seating. Why not try mastic, a sappy resin that was the chewing gum of the ancient Greeks; free samples at the Hellenic Experience tent. Save room for loukoumades, deep-fried pastry balls drenched in a honey syrup and dusted with cinnamon and sesame seeds. Two recent Kenyon College graduates are pursuing their love of theater and history by producing a classic Greek tragedy. Tonight, O’Hara resident Jeffrey Gardner and David Flaherty, of Sewickley, will open Euripides’ classic Greek tragedy “The Bacchae” as the inaugural production of their newly formed Fourth River Theatre Ensemble. The production will have four performances. In choosing a name for their company, Flaherty and Gardner wanted to include a Pittsburgh reference. While doing a history project, Flaherty learned about Pittsburgh’s “fourth river,” an aquifer that flows beneath the city. It was only after naming their company that its founders learned of the Three Rivers Arts Festival’s Fourth River Project, a separate undertaking which has no relationship with Fourth River Theatre Ensemble. Gardner always had loved Greek history and Greek tragedies. For his junior honors project he had studied long past and recent productions of “The Bacchae” and researched how others had worked with its text. First produced circa 405 B.C., Euripides’ “The Bacchae” focuses on the struggle between Thebes’ King Pentheus and the god Dionysus and his followers, The Bacchae, who seek to convert the citizens of Thebes to a new religion. The play’s central struggle is between traditional Greek religion and culture, and a new, potentially disruptive way of living. The production will incorporate dance and music, and a contemporary, yet not period-specific setting that emphasizes its timelessness. Where: The New Hazlett Theatre, 6 Allegheny Square, North Side. Scenes of battle are to hit Walthamstow tonight with an open-air production of Shakespeare’s Henry V.
The history play is chock full of armoured action, sword fighting and political intrique and will be luxuriously costumed with clothes borrowed from the Royal Shakespeare Company. The production, by The Greek Theatre Players, will show in the amphitheatre in the grounds of Walthamstow School for Girls, on Church Hill, from today until Saturday and again from Wednesday to Saturday next week. The Greek Theatre Players have been putting on a summer Shakespeare play for almost half a century. And the company’s secretary, Helen Greenhall, promised “rousing speeches that stir the spirit, comic exchanges to relieve the tension, and a gentle encounter with a French princess as night falls and the lighting glows will provide something for everyone in this truly romantic setting”. Henry V, who was born in 1387 and reined from 1413 to 1422, was one of the great warrior kings of the Middle Ages who united Britain and France under one throne. Part of a tetralogy, the play is one of three following mediaeval monarchs Richard II, Henry IV and Henry V, and it looks at the events immediately before and after the Battle of Agincourt during the Hundred Years War. In 1989 Kenneth Branagh made a film of the play, with himself in the title role. Tickets cost £7 with concessions £4, and are available at the gate. Doors open at 7pm and the performance starts at 7.30pm. Take blankets to sit on and extra clothes in case it gets cold. Posted by grhomeboy in Food Recipes. To make the sauce: In a saucepan, melt the butter over medium heat. Stir in flour. Gradually add hot milk, continuing to stir until smooth. Remove from heat. In a large bowl, beat eggs until almost frothy. While still beating, add the hot mixture to the eggs slowly. Whisk or beat on low until mixture is smooth and thickened slightly. Add salt, pepper and nutmeg. Set aside. To make the meat filling: In a large skillet, heat oil until shimmery over medium-high heat; add onion and garlic. Sauté until softened but not browned, 5 to 8 minutes. Add the ground beef, in batches if necessary. Cook, breaking up clumps with a wooden spoon. When thoroughly cooked, pour off excess fat. Add parsley, cinnamon, nutmeg and tomato sauce. Stir in well. Pour the wine into the tomato sauce can, stir well to get the last of the sauce and add wine to the meat mixture. Cook uncovered, stirring occasionally, about 15 minutes. Taste, and adjust seasoning with salt and pepper. To assemble: Cook pasta according to package directions, drain and rinse in a colander. In a large bowl, combine pasta with ¾ cup of grated cheese, melted butter and 2 cups of the béchamel sauce. Mix in all the meat filling. Spray or butter a large casserole, 10 by 15 by 3 inches or so. Spoon the pasta and meat mixture into a smooth layer. Pour the rest of the béchamel sauce over the pasta and meat. Sprinkle with remaining grated cheese. Dust top with paprika. Bake for about 1 hour, until top is golden brown and puffed and cheese is melted. Cool 20 minutes before cutting. Serves 12. In a large pot, heat the oil over medium heat until shimmery. Add the pork, in batches if necessary to avoid overcrowding. Brown nicely on all sides. Remove, and set aside. Pour out excess fat in pot, leaving about 2 tablespoons. Add the sliced onion and the minced dill. Sauté until onion is softened, 5 to 8 minutes. Return meat to pot with onions, add 2 cups of water and salt and pepper to taste. Bring to a boil, reduce to simmer, cover and cook slowly for about 30 minutes. Wash greens thoroughly. Chop coarsely. Add to the pot, and continue cooking on low about 45 minutes. Stir occasionally. When pork is fork tender and the greens cooked down, add the egg lemon sauce, stir to combine. Serve hot with lots of bread to soak up the juices. To make sauce: Measure out 2 cups of broth from the simmering pork. If there is not enough broth for 2 cups, add water to make up the difference. Put broth in a saucepan. Keep at a simmer. In a bowl, combine eggs, lemon juice and flour. Whisk or beat slowly with electric mixer until slightly frothy. Slowly add the hot broth, ¼ cup at a time at first, so the eggs do not cook. Continue to whisk briskly or beat with a mixer at low speed. When all broth is mixed in, return sauce to the pork and greens. Shake pot or stir gently to distribute sauce. Let stand 10 minutes or so before serving to blend flavors. Serves 6.